Mobile Apps such as WhatsApp and Snapchat dominate children’s and adolescents’ communication habits. Additionally, self-presentation on Instagram and Facebook is booming. Smartphones and the mobile internet have become fully integrated in children’s and adolescents’ daily lives. However, is the permanent connection and availability really “smart”? In adolescence, individuals are particularly vulnerable for the various dangers the smartphone use entails such as communication stress or cyber bullying. However, they can also strongly benefit from positive effects of smartphone use such as the bonding capital. Yet, existing research lacks a comprehensive analysis of the positive and negative effects of smartphone usage on adolescents’ and children’s development in the long term. Additionally, a systematic investigation of individual and contextual factors involved seems warranted. This project aims at filling these pressing research gaps and investigates the effects of smartphone use on perceived loneliness and school performance of children and adolescents using an innovative multi-method-design. In a first step, the participating students conduct guided interviews with peergroup members to investigate the role and significance of smartphone use in their daily lives. Based on the results of these interviews, we conduct a representative, longitudinal panel survey with children and adolescents as well as with their parents. The participating students help designing and analyzing the results of this survey. 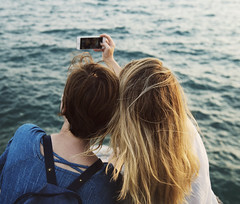 Finally, all participating students record their individual smartphone use as well as the linked emotions and attitudes using the mobile experience sampling method, which allows assessing adolescents’ motivations, attitudes and emotions in the moment itself. In sum, the participating students as highly active smartphone users contribute with their individual experiences to the investigation of the consequences of smartphone usage in adolescence in an important way. Finally, in addition to getting in touch with research methods in the social sciences, they learn to critically reflect their personal daily smartphone use.